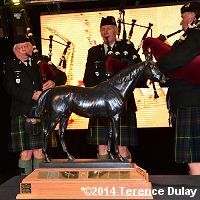 The 39th annual Sovereign Awards, saluting outstanding achievement in Canadian Thoroughbred racing and breeding in 2013, were handed out at a ceremony on Friday night at Woodbine Racetrack in Toronto. Unlike their U.S. equivalent, the Eclipse Awards, horses must have started at least 3 times in Canada to qualify (2 for juveniles). Winning connections are presented with a trophy which is a replica of English racing great St. Simon. Jason Portuondo, who hosts Woodbine's telecasts, was the master of ceremonies. Before presenting the Horse of the Year trophy, Jockey Club of Canada Chief Steward Jim Lawson noted that despite all the troubles the racing industry has faced over the last 2 years, this was the best attended Sovereign Awards ceremony in recent memory. The Horse of the Year title went to Up With The Birds, who was also named Champion Three-Year-Old Male. The home-bred son of Stormy Atlantic out of the Seeking the Gold mare Song of the Lark was 4 for 6 for trainer Malcolm Pierce with wins in the Marine and Breeders' Stakes at Woodbine, the Black Gold Stakes at the Fair Grounds, and the Jamaica Handicap (G1) at Belmont Park. San-Son Farm also won for Outstanding Breeder. Owner Rick Balaz of Sam-Son Farm said, "Getting these horses to the track on time, and making sure we don't go out of control with our spending, are very critical in this business. Obviously we've got great depth in our broodmare band and that's how we end up with horses like Up With The Birds. This little guy gave us so may thrills, he's such a hard trying horse. He didn't always have the best of luck but he never gave up. We hope to see a whole lot more from him this year." 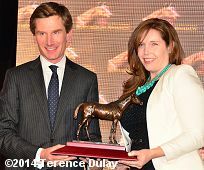 Nick Eaves, CEO of Woodbine Entertainment, presents the Outstanding Owner award for John Oxley to Kathryn Sullivan. 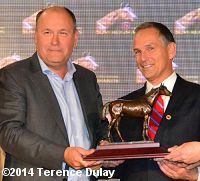 This was the second consecutive win as top owner by Oxley. Trainer Mark Casse and owner John Oxley were not present tonight as they were in Keeneland for the Blue Grass Stakes tomorrow where they have Coastline running. 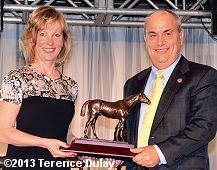 Assistant Kathryn Sullivan accepted awards for Sisterly Love as Champion Older Female, Mark Casse as Outstanding Trainer and John Oxley as Outstanding Owner. This was the sixth Outstanding Trainer award and the third consecutive win for Casse who is the perennial leading trainer at Woodbine. This was the second straight year Oxley has been named Outstanding Owner and he has been the leading owner at Woodbine by earnings for the last two seasons. Oxley and Casse teamed up for 27 wins last year, including 9 stakes wins. Their stakes winners included Prince of Wales Stakes winner Uncaptured, last year's Horse of the Year. In his prepared statement read by Sullivan, Casse said, "Although the award goes to me, it is really about our team at Casse Racing. There is one individual that I would like to draw attention to tonight. Without him we would not be accepting this award, and that is (assistant) David Adams. David is a smart hard working young man and has been an important part of Casse Racing for many years. After all the turmoil the past several years, there is finally a light at the end of the tunnel." 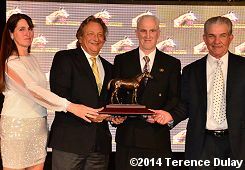 Eugene Melnyk accepts the Champion 3-Year-Old Filly award for Leigh Court from Woodbine Archivist Tom Cosgrove along with his farm manager Phil Hronek and trainer Josie Carroll. 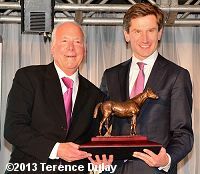 Owner Eugene Melnyk's homebred Leigh Court won the Champion 3-Year-Old Filly award and was nominated in two other categories. 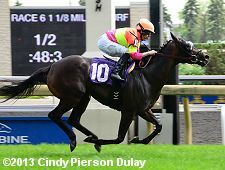 The daughter of Grand Slam out of the French Deputy mare Padmore won five of her nine starts in 2013 with wins in the Duchess Stakes, the Ontario Colleen (G3), and the La Lorgnette Stakes. 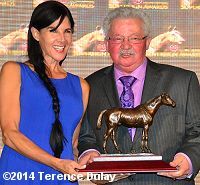 Owner-breeder Eugene Melnyk said, "To the judges, you're always invited to Barbados... I'm looking forward to another great year with Leigh Court, she's very frisky. I would never date her! She's nasty, she likes peppermints which I equate to diamonds, she's never satisfied. But she can run!" Champion Older Male went to Alpha Bettor owned by Bulldog Racing and trained by Daniel Vella. A son of Alphabet Soup, his season included wins the in Eclipse Stakes (G2), the Seagram Cup (G3), and the Autumn Stakes (G2) all at Woodbine. Forte Dei Marmi won for Champion Turf Male and was a finalist for Horse of the Year. Trained by Roger Attfield and owned by Stella Perdomo, the British-bred is by Selkirk out of the Sadler's Wells mare Frangy. His 2013 season included wins in the Singspiel (G3), Sky Classic (G2), and Northern Dancer Stakes (G1) all at Woodbine. 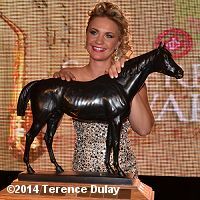 Woodbine rider Skye Chernetz won the Outstanding Apprentice Jockey award in her second year being nominated. In 2013, she had 54 wins in 580 starts with earning so of $2,152,103, and won her first two stakes races aboard 2-year-old filly On Rainbow Bridge in the Shady Well and the Nandi Stakes. 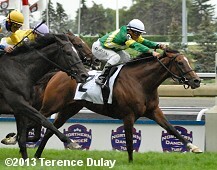 Chernetz said, "I'd like to thank every owner and trainer who let me ride their horses especialy Dave Cotey. And definitely my mom (Bonnie Eshelman, one of Canada's first female jockeys) who is one fabulous person and I would not have any of this without her." 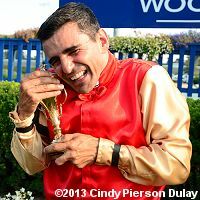 Taking home his second Outstanding Jockey award was Eurico Rosa Da Silva who had 143 wins in 660 starts with $8.2 million in earning with a whopping 27 stakes wins, best of any rider in Canada. He was the regular rider for Horse of the Year Up With The Birds and Champion Turf Male Forte Dei Marmi. Da Silva said, "It's a real honour for me, my wife Claudia and my son William. However my year was not perfect. 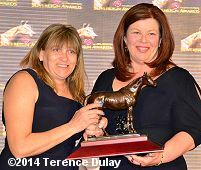 I thought I was on the best horse in the Queen's Plate but we just missed." Recognizing the rest of the Woodbine jockey colony, he added, "Running against the best makes you the best. Tomorrow, opening day let's rock and roll, good luck to everybody!" Phil's Dream, a home-bred by Philanthropist out of Dream A Dream by Emperor Jones, won 7 of his 10 starts enroute to winning Champion Male Sprinter. 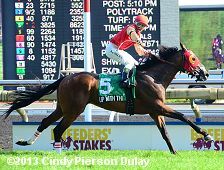 Owned, bred, and trained by Paul Buttigeig, the 5-year-old gelding won three stakes at Woodbine: the Overskate, the Nearctic (G1), and the Ontario Jockey Club Stakes. Buttigieg had the shortest acceptance of the night, saying, "I would just like to give special thanks to my assistant Ricky Hayashi. Thank you!" Champion Female Sprinter went to the aptly-named Youcan'tcatchme owned and bred by Murray Stroud and trained by Sam Di Pasquale. 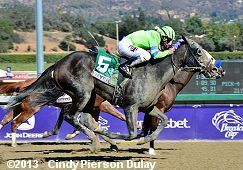 The daughter of The Daddy out of the Yankee Victor mare Poppy's Baby Girl won 3 of his 5 starts in 2013 including the Etobicoke Handicap, Deaway Stakes (G3), and Ontario Fashion (G3). Stroud said, "I'd like to recognize everybody in the industry, we're all here because we love the animal, and I'm here certainly because I love horses. I'm very fortunate to have a horse like Youcan'tcatchme. She has a personality, unbelievable to be around. (Her dam was) the first mare I bought, and this is the first foal I had out of the mare. So it's very gratifying to be here, but it's all a team effort. She's been through a lot, she had a back injury as a 2-year-old, as a 3-year-old she had a condylar fracture. But she got back from that." In the media categories, Patti Tubbs won the Outstanding Photograph award for for her photos of mud covered jockey Frank Fuentes. Alex Campbell won his first Sovereign in the Outstanding Writing category, for his article in the Blood Horse "Saved for Now", and Woodbine's Broadcast Department won their third Sovereign for Outstanding Broadcast, for their coverage of the Ricoh Woodbine Mile. Here are the vote totals for the top three finalists for all the awards along with photos for several of the equine winners. Votes were cast for the top three choices, 4 points for first, 2 for second, and 1 for third, in each category by voters and the top point getters were named the finalists. The voters are individuals serving in industry positions such as senior racing officials, racing journalists and commentators, as well as provincial representatives of the Breeding and Horsemen's organizations. The judging for the 2013 media categories was performed by the Journalism Professors at Humber College, School of Media Studies & Information Technology, in Toronto, Ontario.